Mango Mastani is ready when ‘ “Mastani” Aam ho jaye ‘ !! 😀 When the flavorful summers call for a cool drink, try this non-alcoholic soothing shake. 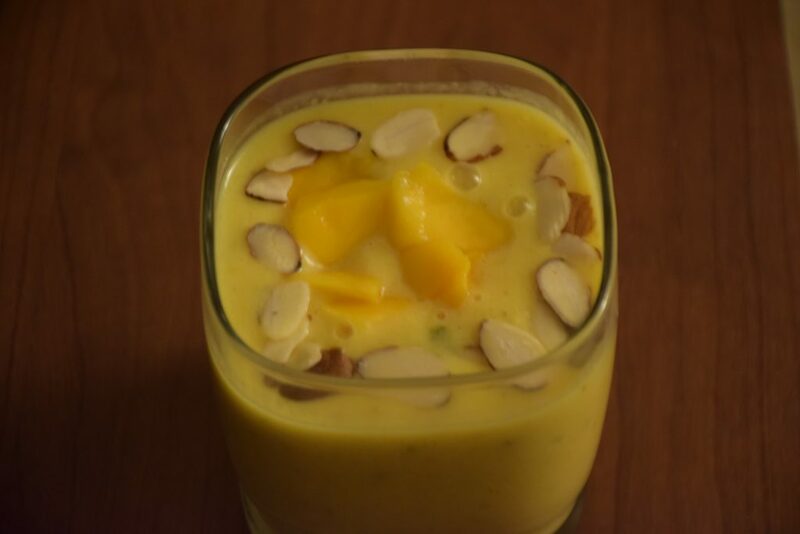 It is not only easy to make but with fresh mangoes it tastes refreshing. As the name suggests, you will need milk, mangoes, nuts and sugar (if needed) and not to forget a blender or a food processor. Although, I have shared a mango shake’s recipe earlier, but looking at the pictures of Mango Mastani , I was forced to make it again her way. I can’t recall her name , but I remember the drink’s picture very well. So thought of recreating it in my way. 1. Slice the mango in half from both sides of the seed. Cut out squares with a knife in both the parts and scoop out the mango with a spoon in a bowl. Discard the seed and the skin. If you have canned mango pulp (4 tbsp) you may use that too. 2. Add the mango cubes in a jar, save 4-5 pieces for garnishing. Then add , half the quantity of milk and pulse them together. Once they are minced well, add sugar, cardamom powder and the remaining milk and pulse again. 3. You will see a frothy yellow fresh drink in the jar. 4. 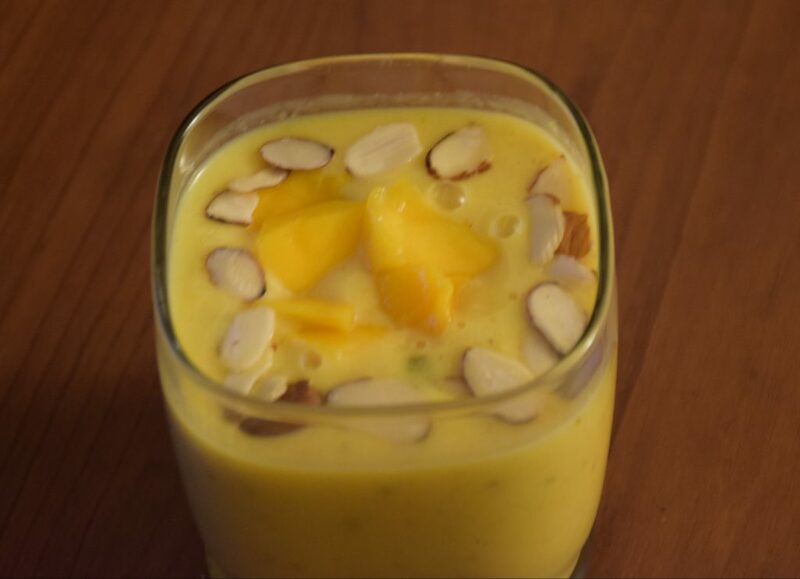 Serve it in a glass and top it with some mango pieces, pistachios,almonds and ice(if you like). Enjoy this cool fresh nutritious shake with family and friends. It is a good idea to feed your stubborn kids with milk and mangoes. So this summer this a must . Please feel free to leave your comments below . 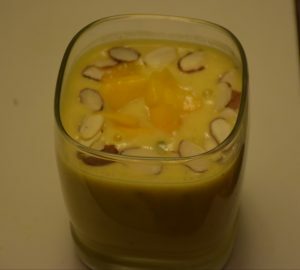 This entry was posted in Drinks, Food, Kids- Favourite, Recipes and tagged aam, Carenshare, doodh, drink, Elaichi, kids favourite, king of fruits, mango, mastani, milk shake, shweta jindal, sugar-free, summer, zindagisikhati.